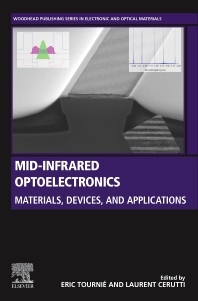 Mid-infrared Optoelectronics: Materials, Devices, and Applications addresses the new materials, devices and applications that have emerged over the last decade, along with exciting areas of research. Sections cover fundamentals, light sources, photodetectors, new approaches, and the application of mid-IR devices, with sections discussing LEDs, laser diodes, and quantum cascade lasers, mid-infrared optoelectronics, emerging research areas, dilute bismide and nitride alloys, Group-IV materials, gallium nitride heterostructures, and new nonlinear materials. Finally, the most relevant applications of mid-infrared devices are reviewed in industry, gas sensing, spectroscopy, and imaging. This book presents a key reference for materials scientists, engineers and professionals working in R&D in the area of semiconductors and optoelectronics. Eric Tournié is a professor of electrical engineering and photonics at the University of Montpellier and a senior member of Institut Universitaire de France (IUF). He is an expert on the epitaxial growth of compound semiconductor heterostructures and devices. His interest has always been the development of new nanostructures for applications in optoelectronic devices. Laurent Cerutti is an Associate Professor at the Université de Montpellier since 2006. He obtained his PhD in 2004 from the Université de Montpellier on the molecular beam epitaxy of Sb-based VCSELs. He spent 2 years at the Polytechnic University of Madrid in the group of the Pr. E. Calleja where he developed the first GaN nanocolumns grown by MBE on Si(100). Since 2006, his research activities focus on the development and the MBE growth of Sb-based photonic devices, mainly for the development of MIR VCSELs, lasers grown on Si and plasmonic structures. He has been involved in several European projects (FP6, FP7, ITN, H2020) and has been involved/coordinated several national projects. He is author or co-author of ~ 100 publications in peer-reviewed journal, conference proceedings and two international patents. In 2016, he was guest editor for the special issue of the Int. Molecular-Beam Epitaxy (MBE) conference in Journal of Crystal Growth.